Thursday night, first thing after getting my sample cup, I am heading straight to D18 to hit New Glarus Brewing Company. Hopefully, they will have their Belgium Red for me to cross that off my list (tied for #16). Last year, New Glarus was extremely busy and ran out of beer real early, so this year I'm going to be one of the fist ones to track them down. At some point I need to drop by J3 Heretic Brewing Company and see my home-brewing idol Jamil Zainasheff. Perhaps I can get a picture with him. Perhaps I can even get him to sign my chest. Oh, and I also want to try his beers. This year, I would really like to attend some of the talks in the Brewers Studio Pavilion. The one I'm most interested in is the first one on Thursday night, "Celebrating 30 Years of the GABF". Hopefully I can get there after hitting New Glarus early. I want to make sure I sample the entries for the Pro-Am competition. At least, I think they are available to taste. So, there is the start of my plan for the GABF weekend. Maybe, I'll let you know as I fine-tune it. If not, I'll at least report back from the event. And ... just today I got an email from GABF announcing that there will soon be an iPhone app for GABF. 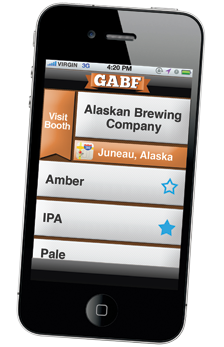 See iPhone App Available Soon on the GABF website. This happens to be the first time EVER that I've wished I have an iPhone. This sort of thing would be awesome to help me track down the beers I want to try. I wish they would have had the fore-site to develop an Android application, so at least my wife could have it. Of course it would have been even better if instead of spending time developing an app for one type of device, they included all this functionality on a smart-phone optimized portion of their website so that every single mobile device could access the information. I actually did not find that the one ounce sample of the chili beers I had last year ruined my pallet too much. I found that towards the end of each session my pallet was a bit dulled from the amount of alcohol I'd consumed, but I'm not sure there is much you can do about that. Actually, I think we only found one or two chili beers last year, and I those were consumed a bit later in the evening. As a Texas beer fan I'm gonna have to promote Austin Beerworks, Real Ale, and (512) Brewing. Good luck, I'm currently working on my list to try and came across your blog.